1. Stay organized from day one. I’ve been taking 2-3 classes a semester while working full time, so it would be easy to miss a deadline. As soon as I get my syllabi, I put class dates and important deadlines on a “school” Google Calendar. It shows up in bright red and sends me reminders – just the kind of subtlety I need. As an undergrad I’d do my reading, then later return to study it. Now, with less time, I immediately identify the important concepts and either outline them or, if I will be tested, create flash cards (I use studydroid.com to enter cards on the web and study on my Android phone). This boosts my comprehension while reading and saves hours of preparation during final exams. 3. Keep it all in one place (preferably online). My notes, assignments, papers, and readings (if possible) are all in Google Drive. If I have an insight when I’m away from the computer, I can access and edit from anywhere. I’ve eschewed heavy textbooks for e-books and Kindle editions so I can sneak in a chapter of my reading in a waiting room or on the bus. 4. Put away the stopwatch and think outside the paper. 5. Create weekly study sheets for non-humanities classes. For classes like statistics and accounting, I got a feel for the scope of the material each week and then broke it down into smaller parts. Each week, I made myself a study sheet with formulas and the various types of problems along with the steps necessary to solve them. This helped me identify the concepts that needed more practice and was so valuable for review at the end of the semester. 6. Make room for school, but don’t put your life on hold. 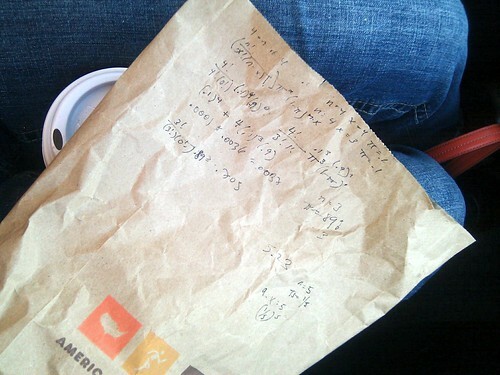 I ended up practicing statistics in the passenger seat of our anniversary weekend road trip…on a Dunkin Donuts bag. I read e-books on planes and took online quizzes over hotel wifi. The past two years have been filled with school but also fun and adventure. Keep enjoying your life or you’ll get burnt out. If I had been stuck at home, I probably would have been listlessly staring at that blinking cursor. My interest in censorship issues was first piqued by the Parental Advisory Label; its standardization in 1990 coincided with my first music purchases. 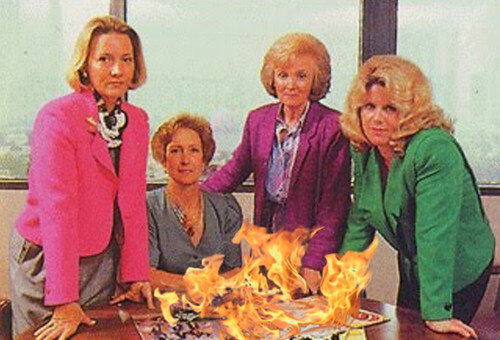 At the time, my strong feelings about the PMRC led me to write a letter to Tipper Gore (it was written in pencil on 3-hole paper from my Trapper Keeper). I’m not sure if I ever sent that letter, or if she received it, so consider this blog post my 20-year-late follow-up. Even as a pre-teen I sympathized with parents’ desire to know about their kids’ musical choices (though this would be better accomplished through research and conversation), and I knew that limiting sales to those under 18 was not exactly tantamount to censorship. But the movement and its leaders’ intentions made me wary of the creeping scope to which civil liberties infringements are susceptible. For example, the PMRC originally proposed labels that were more specific than, say, the FCC’s guidelines for obscenity (which I also find suspiciously subjective). One of their proposed categorizations was “O”, which would apply to music with occult content. This was clearly religious discrimination. After the senate hearing, the RIAA dropped these categorizations in favor of a general label, and the labeling program is voluntary; still, it left me suspicious about the motivations of would-be censors. Civil liberties have been on my mind a lot lately. Last week, I went to see Glenn Greenwald present about “Civil Liberties in the Age of Obama” at Brown University. He made many great points, including that civil liberties are hard rules…not negotiable, for example, in “times of war”. We can’t, as Reagan did in the above quote, speculate on the intentions of our founding fathers. The Bill of Rights is so powerful and relevant because of its non-specificity: it continues to protect the minority from the majority reglardless of the specifics of current issues. 1. Many people believe if they aren’t currently targeted, civil rights violations shouldn’t worry them. But Mr. Greenwald emphasized that they should, because civil liberties violations are subjective and bound to have a creeping scope: a scope which may very well include them someday. This really resonates with me. 2. Potential civil liberties violations are “sold” to the public by the use of repugnant examples. A case I saw recently: US can conduct off site searches of computers seized at borders. It’s OK, because it helps us catch pedophiles, right? We should be suspicious of this kind of marketing. Susan VandenBerg is the new pastry chef at Gracie’s in Providence. I came across her husband Steve’s blog Eating Out in America, which chronicles their restaurant experiences and occasionally their lives (like in this great video of Susan’s New Year’s Eve preparations at the restaurant). I was curious about Susan and the magic she works in Gracie’s kitchen so I decided to ask her a few questions. Is there a certain country or region whose pastries and desserts especially inspire you? I have to say that France, and particularly Paris, are the areas that inspire me as far as desserts and pastries go. I love the various doughs i.e. croissant, puff pastry, brioche, and my favorite thing is the tart – so many variations and wonderful flavors! Of course I’m swayed by the fact that I went to school and did an internship in Paris. What can I say? Where, besides Gracie’s or home, is your favorite place to eat dessert in Providence? I have to admit that I haven’t been out and about much in Providence, since work takes up most of my time, but, so far, Pastiche has my vote for desserts. The place reminds me a lot of a European shop, and their product is delicious to boot. 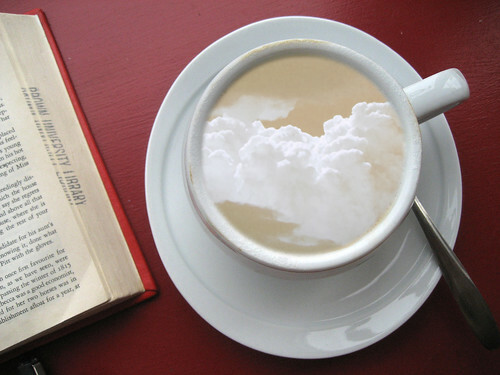 What’s the most unusual ingredient you’ve ever used in one of your creations? Unusual ingredient you ask – hmmmmmm, that’s a tough one. I think using various spices in chocolates would be the most unusual – paprika, five spice powder and pepper to name a few. When did your interest in cooking start? My interest in baking started many years ago, probably with the standard Tollhouse chocolate chip cookie. I’ve loved baking for a long time and find it very relaxing and comforting. If you weren’t a pastry chef, what would you be doing? I would be making handcrafted folk santas, teddy bears, Nantucket baskets and anything else I can do with my hands. Thanks to Susan for answering my questions and being the first interviewee on this blog. I haven’t been to Gracie’s in a couple of months and definitely have to return to try her desserts!